Cumulina died Friday of natural causes due to aging, 31 months after becoming the most celebrated mouse in scientific history. "We celebrated her first and second birthdays, I didn't expect a third birthday," University of Hawaii researcher Dr. Ryuzo Yanagimachi said about Cumulina, the world's first surviving mouse clone. 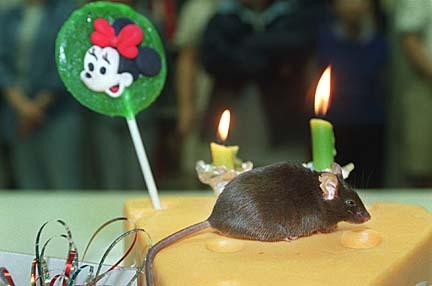 A lifespan of two years and seven months for a mouse is equivalent to age 95 for humans, says Yanagimachi. Mice usually live about two years, he added. Cumulina made world headlines in July 1998 when the distinctive cloning technique developed by Yanagimachi and members of "Team Yana" were announced. Cumulina got her name from the cloning technique that used nuclei from adult mouse cumulus cells that surround the developing eggs in the ovaries of female mice. Cumulus nuclei were injected into enucleated mouse eggs. Cumulina produced two litters before being retired. "She was special and was the only one given a name," Yanagimachi said. "The others have numbers." Cumulina will be preserved and placed on display in a permanent exhibit in the new Institute for Biogenesis Research lab, which will open this fall.